Black Earth Rettenmund Prairie State Natural Area is one of the treasures of The Prairie Enthusiasts and has been under intensive management since TNC first bought the property over 25 years ago. Kathie and I have been the stewards and have managed the burns since 2001. By current standards, Rettenmund is a small site (16 acres), but it is a lovely site, and very easy to visit. The prairie consists of a fairly high NE/SW trending gentle ridge which slopes off both east and west, where alfalfa fields are present. Because there is no corn stubble, there is no problem with spotting outside the burn unit. The site is divided into three burn units, North, Saddle, and South, and two of the three units are generally burned each spring. The darker gray area on the map shows what was burned this year. Just north of the South unit is a small unused pasture owned by a neighbor. The fence, shown in dashed lines, divides the private pasture from the South unit. 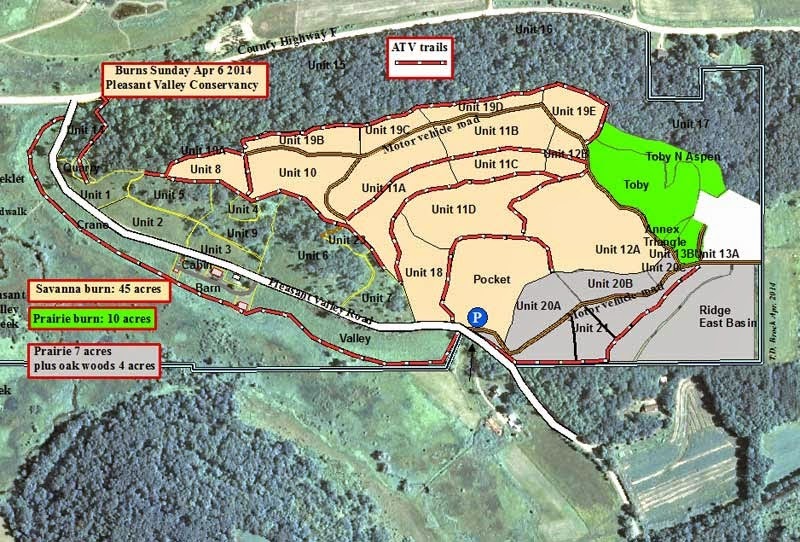 In order to have better control of the burn, since the days of TNC management the pasture and South unit are burned together (with the neighbor's permission). The fire break that Kathie mowed along the north edge of the pasture is shown in yellow. We generally burn Rettenmund in late March but problems this year, mainly weather, kept this from happening. Finally, near the end of April everything gelled and we were able to get the burn done last Saturday (April 26, 2014). Amanda took responsibility for organizing everything and lining up the crew (10 people). Despite the small size of the burn (7 acres), it took 2 hours to complete, and every person involved kept busy the whole time. An interesting side result of burning the pasture: Fire alone has resulted in the conversion of this pasture into a little bluestem prairie, with scattered forbs (butterfly weed, wood lily)! 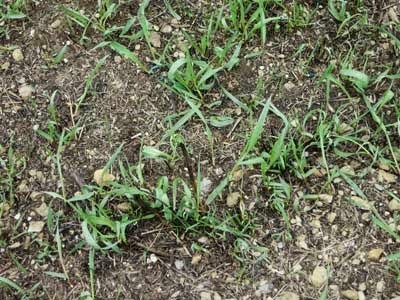 A burn will kill all the above-ground parts but about a week after the burn smooth brome starts to appear. Folks often remark favorably that our burnt prairies are already greening up. However, anything green this early is bad! The main advantage of these newly green patches is that they show us where the bad guys are. Fortunately, this early growth provides the way of getting rid of smooth brome. Since nothing but smooth brome has come up yet, the offending patches can be killed by spraying with 2% glyphosate. This herbicide has the unique characteristic that is completely inactivated by soil particles. This means that it has no residual activity. Therefore, only plants that are green are killed. You can spray with impunity! Since we have already eliminated most of the large patches of smooth brome (as described in the link below), now we are only spot spraying, mainly road cuts. 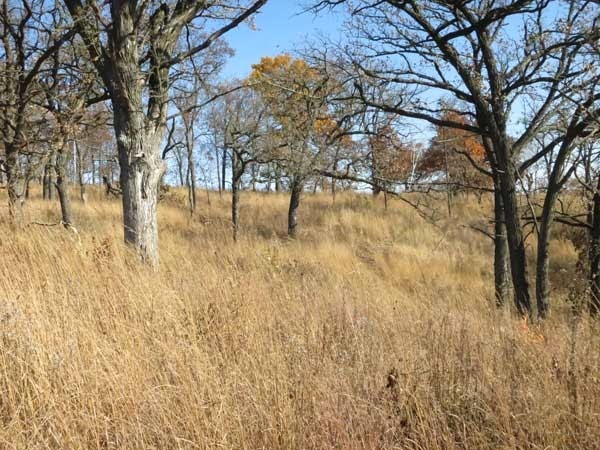 Nice that they call their tallgrass prairie a "National Treasure". Research work and restoration work are often in conflict. It is the purpose of this note to make a plea for the application of common sense in the selection of sites for research purposes. For instance, in southern Wisconsin we have very few high quality sites, and those that we do have are jewels deserving of constant care. Most are completely unsuitable for manipulative field research. 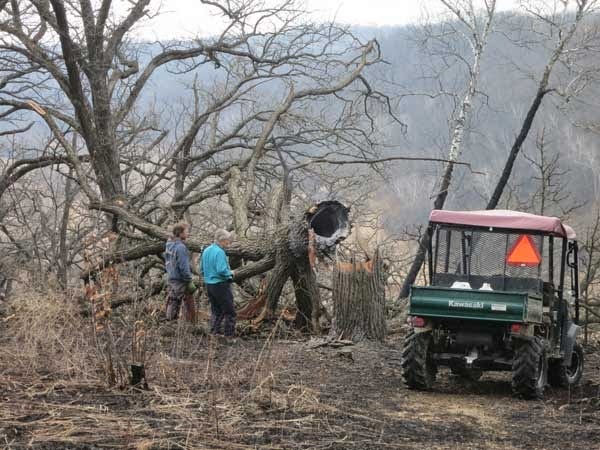 As an example of what I would consider an inappropriate research study is one on removal of aspen (Populus tremuloides) in one of southern Wisconsin’s highest quality sites, a State Natural Area. In this justly famous site, aspen had become a significant invader. The solution to this problem, girdling of the aspens, is well known. However, a decision was made by the managers of the site to do research on this aspen clone using a variety of control methods. Because of this, volunteers interested in preventing aspen spread were refused permission to carry out any aspen control work. In the meantime, the aspen clone continued to expand. 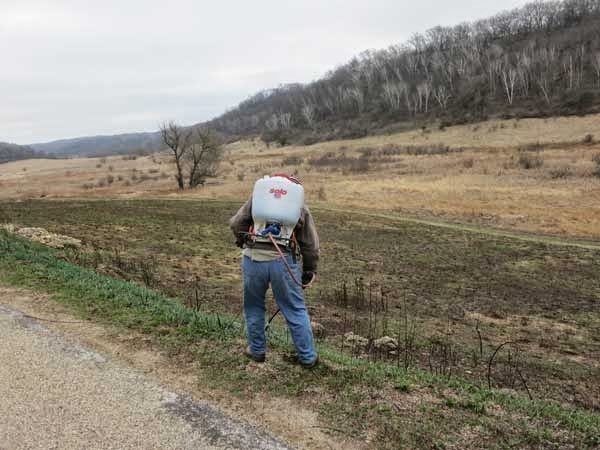 What a waste, since in southern Wisconsin there are large numbers of aspen clones on sites of little or no ecological interest, which would have been perfectly suited for this research. Why should this high quality remnant be allowed to become degraded? Common sense would suggest otherwise. Another example involved a study on the ecology of garlic mustard (Alliaria petiolata), a highly invasive exotic. Garlic mustard is widespread in southern Wisconsin and there are numerous highly degraded sites where it can be studied. However, the study in question used a high quality site where efforts by volunteers to remove this plant had been underway for a number of years. The researchers appropriated a significant portion of this site and part of the research involved allowing garlic mustard plants to remain intact (as controls). 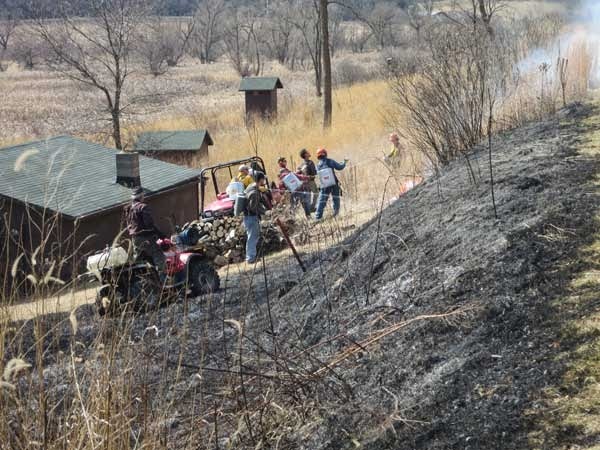 In addition to permitting the plants to remain on the site, this research sent an inappropriate message to volunteers, who had been working diligently to remove every vestige of this highly invasive plant. On the other hand, here is an example of what I would consider appropriate research in a high quality site. In another State Natural Area, a researcher interested in population genetics of a particular plant species was interested in obtaining leaf samples for DNA analysis. Small samples were taken from a number of plants on this site. The plants were barely disturbed and there was no manipulation of the site as a whole. Land managers responsible for the control of high quality natural areas should consider carefully the appropriateness of manipulative research on their sites, especially if the research requires that needed restoration work be held in abeyance. Most high quality natural areas require on-going maintenance and are not suitable research areas. Restoration ecologists should be challenged to find and set aside field sites where manipulative research is possible. Bur oaks are very resistant to damage by fire. However, they do age and the trunks do get hollow, opening them up to fire damage. Just before the burn in Unit 10. Tree #720 is nearby. The fuel here is predominantly Indian grass. After the burn. Parts of Tree 720 can be seen at the right. 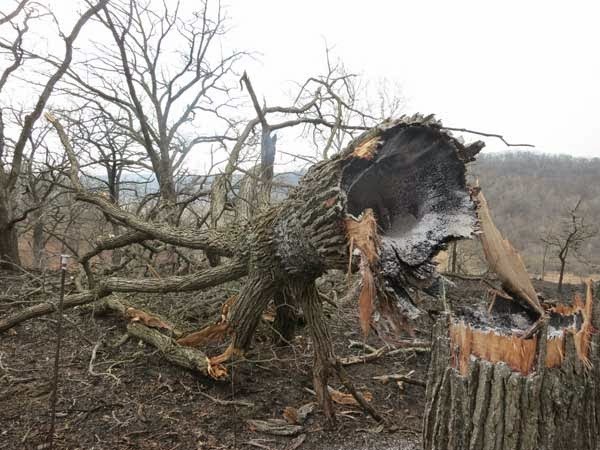 Although this was the largest oak that fell as a result of the burn, there were about 10 other smaller oaks that came down. 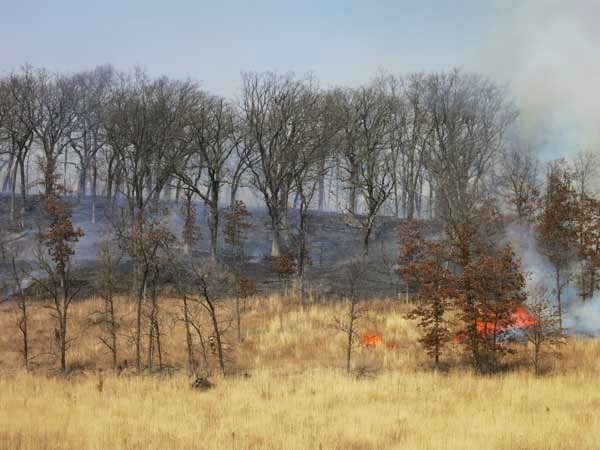 Although the loss of large oaks is sad, it is inevitable in a fire-controlled savanna. In fact, this is one of the ways the canopy stays open. And if the canopy were not open, warm season grasses such as Indian grass could not flourish. The oak savanna of Pleasant Valley Conservancy is not a backyard garden, where every tree is protected, but a natural landscape! 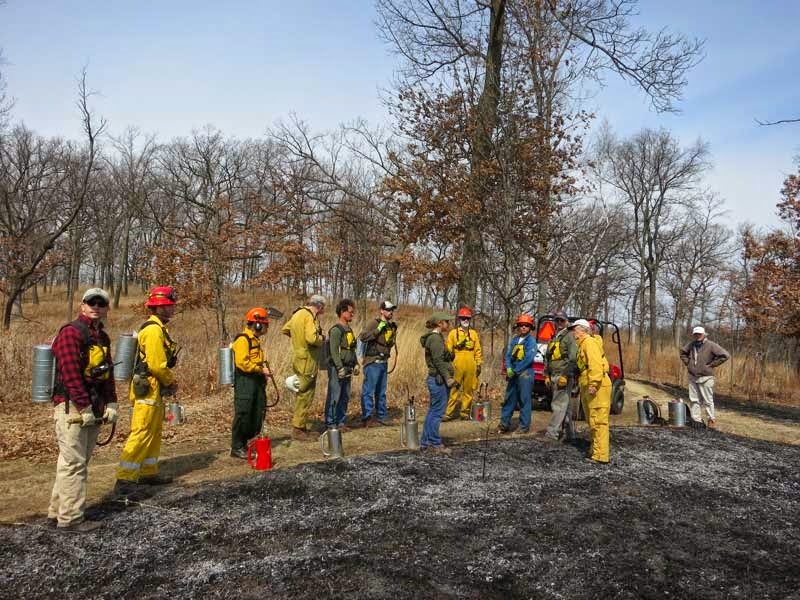 Last Sunday we had very favorable weather and a great crew and got almost all of our remaining burns finished. See this post for the earlier burn. GIS map of the Apr 6 burns. 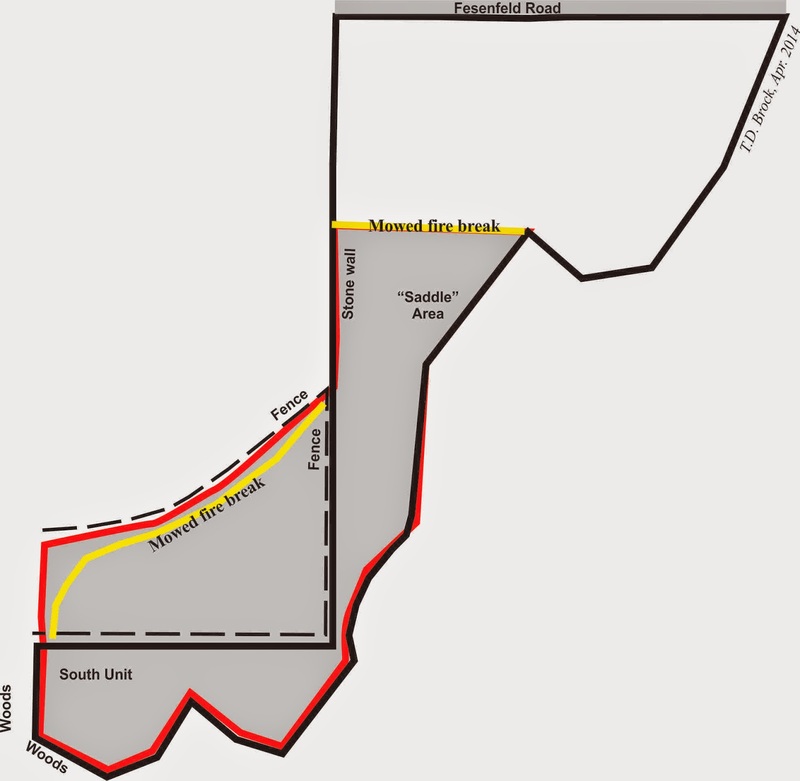 The area shown in green was burned first and the gray last. The savanna burn was especially complicated because the fuel was so lush. With a south wind, we backburned as much as possible. (See photo below) Even with backburns, flame heights occasionally flared up. The fire moving down through unit 11D savanna. Note how lush the fuel is. There was quite a bit of mop-up, and a few large trees that had hollow trunks caught on fire and fell. 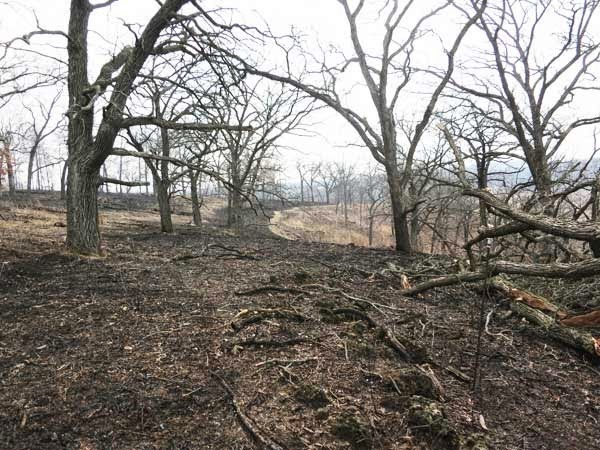 Although we love each individual tree, we realize that in a fire-controlled oak savanna some older trees will fall. 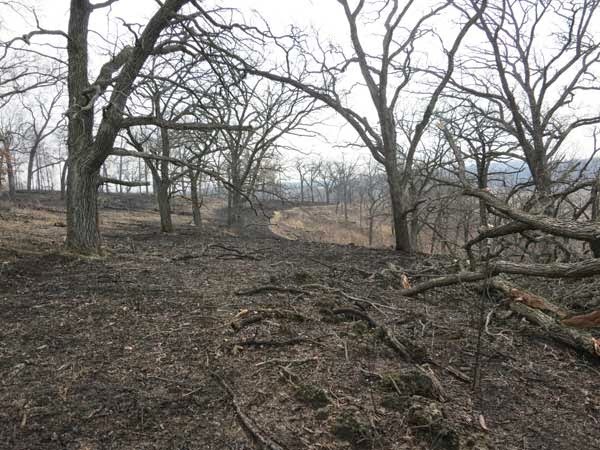 After the burn, unit 10, the large bur oak savanna on the ridge top. The lighter colored area in the distance is the top of the south-facing slope that was burned the week before. 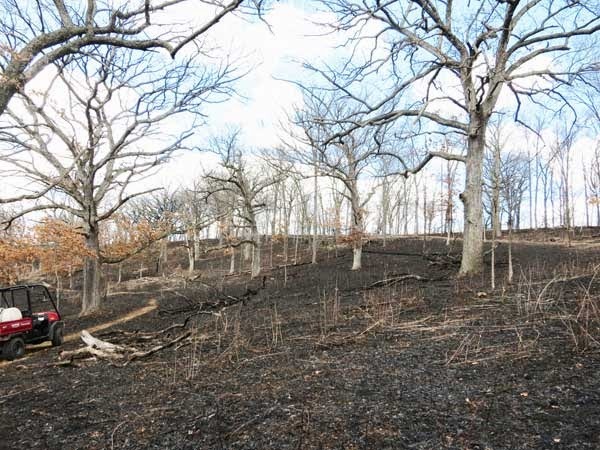 After the burn, large white oaks on the lower savanna slope. 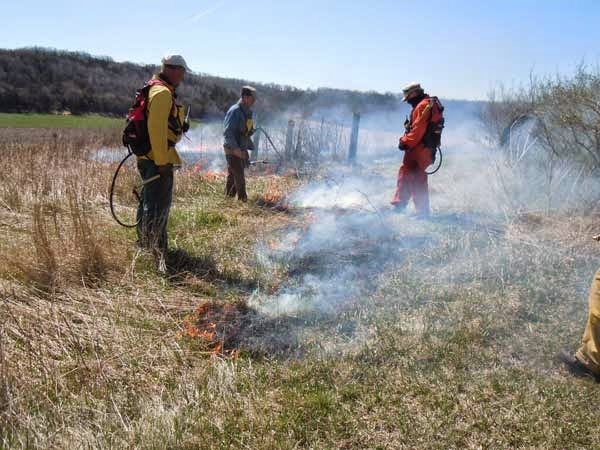 After a late lunch we moved to the east end of the Conservancy and burned the East Basin and Ridge Prairies and the associated oak woods, another 11 acres. The three small buildings here are the cabin, which functions as a small field station, the well house which is an essential source of water, and the privy, also essential. The photo above shows the crowd of people involved. There was only one drip torch, but lots of water. The most important tools were the two pumper units in the ATVs. The water in these units had good pressure and long reaches and served to keep the flame heights low. In addition, we had 4 people with water backcans, who were able to accurately place water where it was needed. 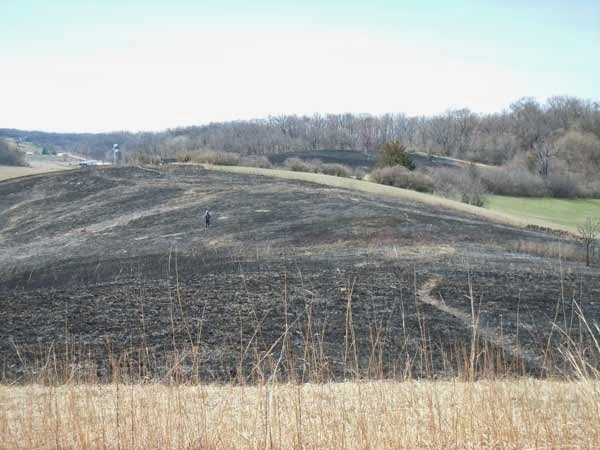 Other planted prairies that we burned were the Valley and Crane Prairies, both of which have complex habitats, varying from wet prairie near the bottom to dry prairie at the top near Pleasant Valley Road.